hi there I am dave i have a hp pavillian dv2000 all of a sudden i only have a screen with my sreen saver picture, no icons no start menu, i have rebuted it it still comes up blank? Are you chatting with a different computer? Remove all external devices, CDs, AC Adapter and battery from the computer. Keep the AC Adapter and battery unplugged. Plug in the ac adapter and monitor ONLY. After pressing the button for 30 seconds, plug in the ac adapter and monitor ONLY. Normally power on the notebook. 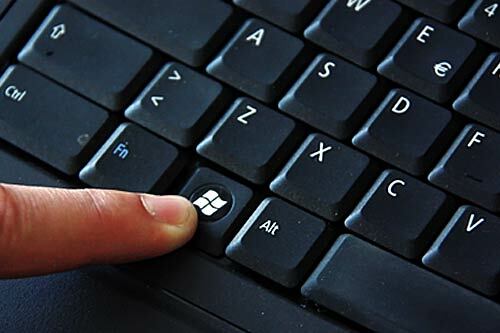 Press the Windows key on your keyboard and check if you get the Start window. Start window with All programs. On your keyboard. between Alt and Ctrl key. A key with a Windows sign. Can you right click on the desktop? Do you get any options while you right click on the desktop? Can I access your computer remotely, so that I can help you better while you watch. However, you will be charged US $30 more for the additional support. If the issue is not resolved, I will help you get a refund. Can you open internet explorer or firefox on the faulty computer? Do you see key like this o your computer? Do you have Windows Start button? On the bottom left corner? Double click on the short cut key. nothing only if right click openf floder send to cut copy etc. Please restart the computer and as soon as it restart, repeatedly press the F8 key to get Advanced Boot Options. Repeatedly press it till you get Advanced Boot options. Please select Safe mode with Networking from the options. Right after you see the HP logo, before starting windows. Do not press and hold. Do you get Advanced Boot options? No display on your computer? Please turn off it, insert the battery and Adapter, then try again. Not even the display that you had before? no nothing may i have started clicking too soon when i first powered up? No. That is not the issue. Do the first step again. Hold the power button down for 20-30 seconds. Plug in the ac adapter ONLY. Normally power on the notebook. Insert the monitor too. try the F8 method again. powerdown then power up f8?? Still the same screen save screen? Okay. Restart it and start like before. Do not use F8. Press the WIndows key and R key togther. It will open Run window. Press Alt, Ctrl and Delete keys together and check if you get Task manager. Press and hold Alt, Ctrl keys and then press Delete key without releasing the other keys. Try again. Press and hold Alt, Ctrl keys and then press Delete key without releasing the other keys. black at moment no task mgr. Please restart the computer tap the F8 key three times and wait. computer is off start the tap as soon as it starts powering up or wait a little? When you see the HP logo, start tapping it and tap F8 two times after the logo. Are you trying to tap right after the Windows logo? Right after restarting the computer, do you see and HP logo? Start tapping F8, right after you pres the power button on the computer. Do you have Windows disc with you? No. That is not the one. Do you have important data on your computer? Please restart the computer and as soon as it restarts, tap the F11 key and check if you get any options. I apologize that I am out of ideas. If you have the Windows disc, I can help you repair Windows. I will Opt Out the question, so that you can check the issue with other experts. can i get a windows disc from someone like my brother or is a lic. just for particular compu. Otherwise, you have to get recovery disc from HP. If you are able to get the disc, please let me know, so that I can assist you later. After getting the disc, try the instructions in the link below. First, try startup repair and then try system restore. Try it and come back. Let me know if you have any doubts. hi Shefin, i do not know how to reply? you worked hard to try to fix my computer, and how much am I going to be charged for a computer that is still a problem? You will not be charged anything if you do not rate the answer. Please get the disc and follow the instructions in the link I have given. Let me know the response. Please get into BIOS and setup first boot device as CD/DVD drive. Restart the computer and as soon as it restarts, repeatedly press the F2 or Del key. Try both, but one at a time. It will open BIOS Setup utility. In BIOS, find Boot option and then find Boot disk priority. Change first boot device as CD/DVD drive and then press F10 to save and exit from BIOS. Insert the disc and restart the computer and follow the instructions in the link. Please let me know the response. UNFORTUNATLY, JUST LIKE BEFORE NOTHING SEEMS TO WORK TO GET INTO ANY OTHER MODE EXCEPT THE BLANK SCREEN SREEN SAVER PIC. I apologize for the inconvenience caused to you. I would suggest you contact a local repair shop in order to get the issue resolved. Please do not rate me Poor or Bad. I have tried my best to help you.